The new MacBook Pro is bare naked. There are no ports except the USB-C Thunderbolt 3.0s and the headphone jack. This has caused a lot of debate as to whether why Apple is getting rid of everything. It has its pros and its cons but few people require the use of old ports (I shouldn’t be calling them old but, hey, looks like we’re in the future). Especially the non TouchBar MacBook which has only 2 USB-C Thunderbolt 3.0 ports. If you’re one of them, then you should definitely take a look at OWC’s Thunderbolt 3 dock. It brings back every single port you have seen till now on the previous MacBook Pros and Macs in general. 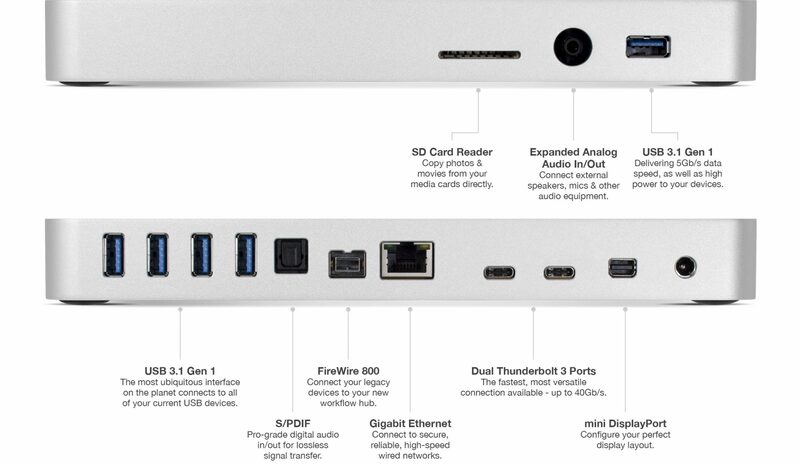 It has thirteen ports to make your new MacBook Pro compatible with all your old technologies (I/O). The dock is a rectangular slab which obviously connects using a USB-C Thunderbolt 3.0 to the MacBook Pro. It has 2 USB-C Thunderbolt 3.0 ports, 5 USB 3.1 ports, the old Firewire 800 port, 1 Gigabit Ethernet port, 1 mini Display Port, 1 SD card reader slot, 1 audio combo port, 1 S/PDIF digital audio port. That’s a lot of ports; you will never have to depend on dongles for every single I/O. The thunderbolt 3.0 ports on the dock can be used to chain 5 different Thunderbolt 3.0 devices and two of the USB 3.1 ports can be used for charging mobile phones. The power of the dock will blow your mind if you are used to working with the quickly dying technologies (I/), it’s not extraordinary but it is indeed a cool piece of tech. All this power doesn’t come cheap, the dock costs a hefty $279. It’s available for pre-order at OWC’s website and will start shipping in February 2017. Till then you’ll have to work with dongles I guess. The docks comes with a 0.5 m USB-C Thunderbolt 3.0 cable for free; well for this price you better be giving something away.